This may just be the best thing that I have ever come up with. Ever. I have no idea how I came up with this recipe. It’s a combination between a frothy, refreshing milkshake and an energizing latte. 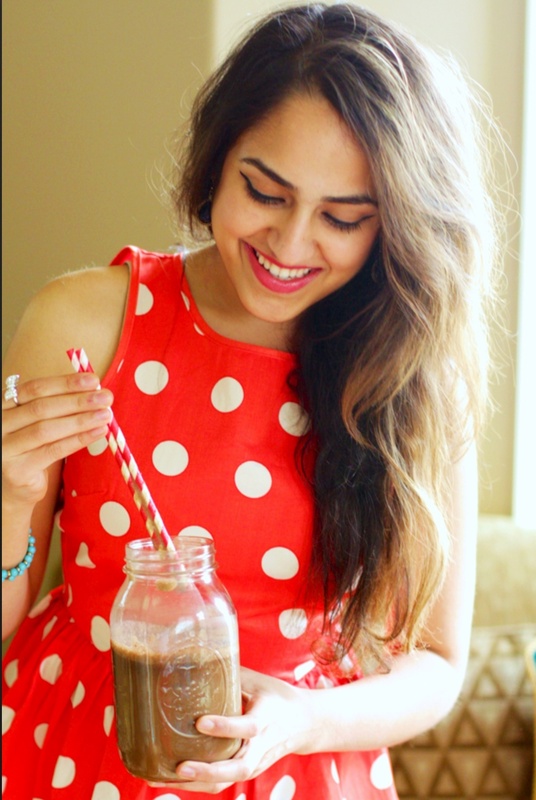 Low in calories, fat, and sugar (sweetened with natural ingredients) and chock-full of nutrients that your body needs, making it a much, much healthier and more beneficial drink than most. 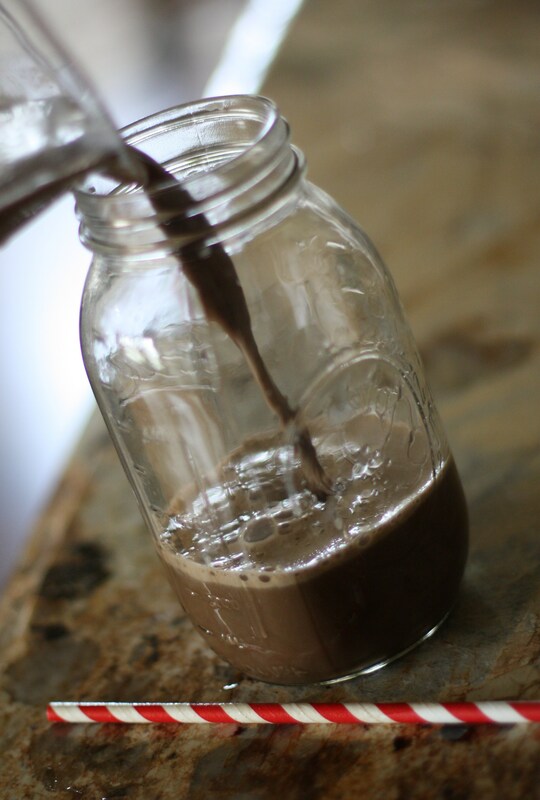 Whatever it is, it’s a great alternative to high-calorie milkshakes and to overpriced Starbucks drinks. 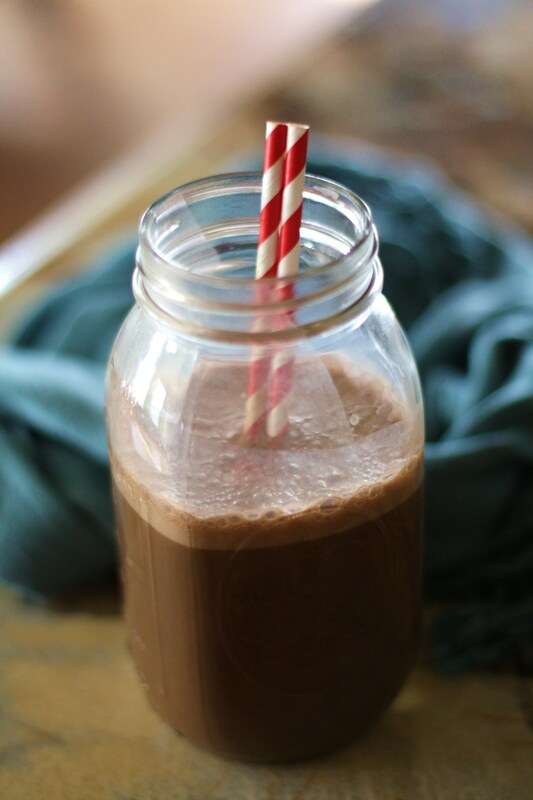 Quite reminiscent of a chocolate-banana milkshake…. …. creamy, smooth, refreshing, delicious, chocolatey, sweet. I like to drink this before working out as it gives me the energy that I need without weighing me down. Or I’ll drink this when I need something sweet and chocolatey (yes, that is an adjective) as an afternoon pick-me-up or as a dessert without going overboard on the sugar. 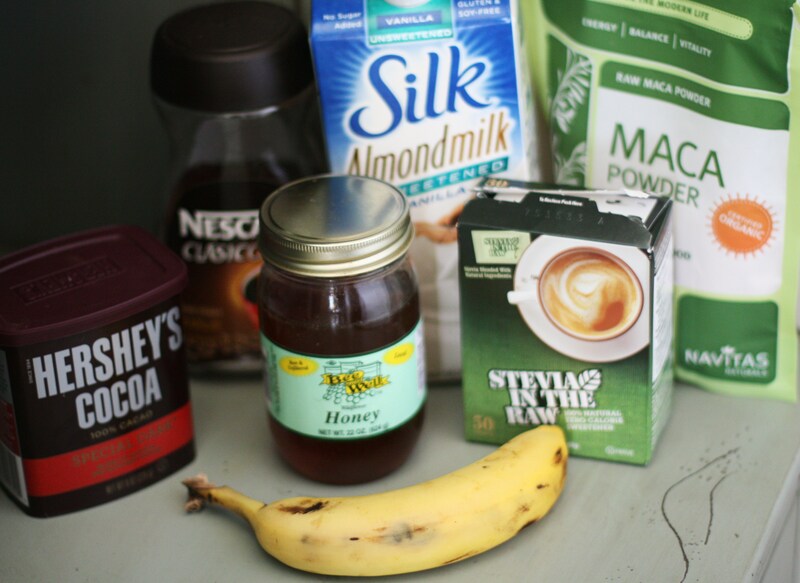 In this recipe, I use almond milk in place of conventional, dairy milk. I am a huge fan of almond milk and have been for quite a while now. Almond milk is a great substitute for those who are lactose intolerant, have dairy or gluten-related allergies, or are simply looking for a lower-calorie source of milk. Yes, it takes some getting used to, but once it becomes an acquired taste, the texture of almond milk is much more pleasing (at least to me) than regular milk due to the creaminess and the subtle hint of the nutty and sweet flavor. But you can’t even taste the almond milk in this recipe! Comparatively, almond milk has a lot less calories than cow’s milk and no saturated fat or cholesterol. It also provides plenty of vitamins and minerals (such as calcium, potassium, vitamins A, E, D) and is heart-friendly. Though the downsides are that it has much less protein and B vitamins than cow’s milk and most importantly, store-bought almond milk is usually watered down and synthesized with food additives (carrageenan, “natural flavor”, etc), so make sure to read the label before buying! The next ingredient is the banana. Bananas are a great source of complex carbohydrates, which makes them a great addition to this smoothie (plus, bananas are just delicious). 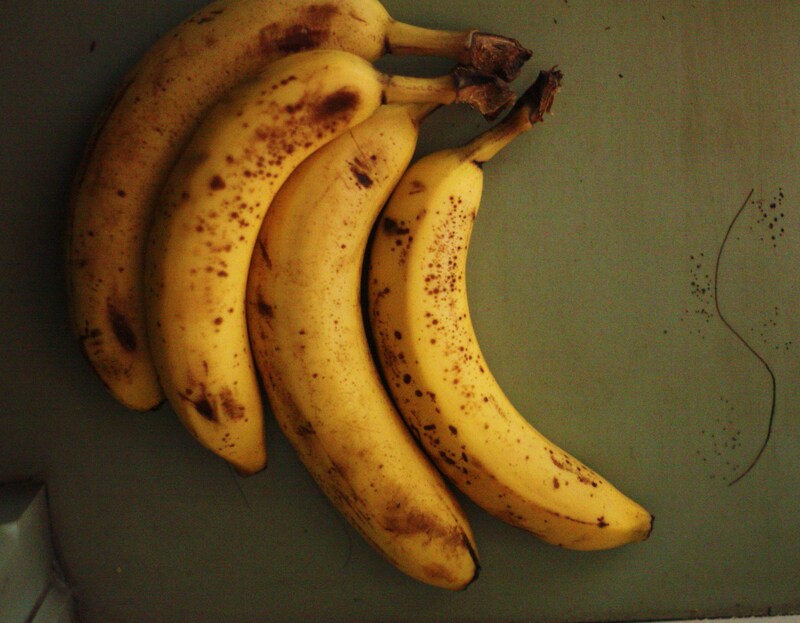 I use 2 ripe bananas, for a sweeter, creamier consistency. Make sure they are ripe with dark patches, trust me. It’s better for your taste buds and for your immune system. Just in case the ripe bananas aren’t sweet enough, I usually add some sort of sweetener. 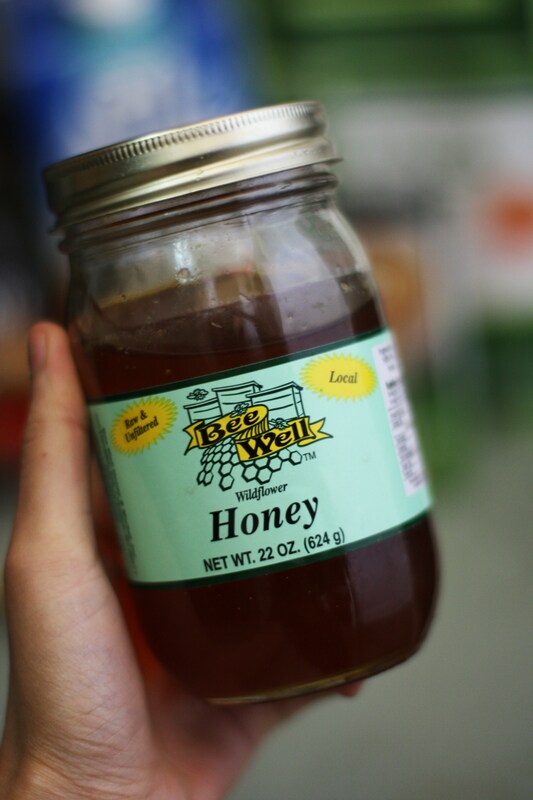 In this case, I used raw, unfiltered honey (compared to commercial honey, raw honey still retains the naturally-occurring enzymes and phytonutrients that are destroyed in the processed version). As for the superfood ingredients (though bananas and honey do qualify as superfoods), I added maca powder and cocoa powder to further boost the nutritional content of this smoothie. 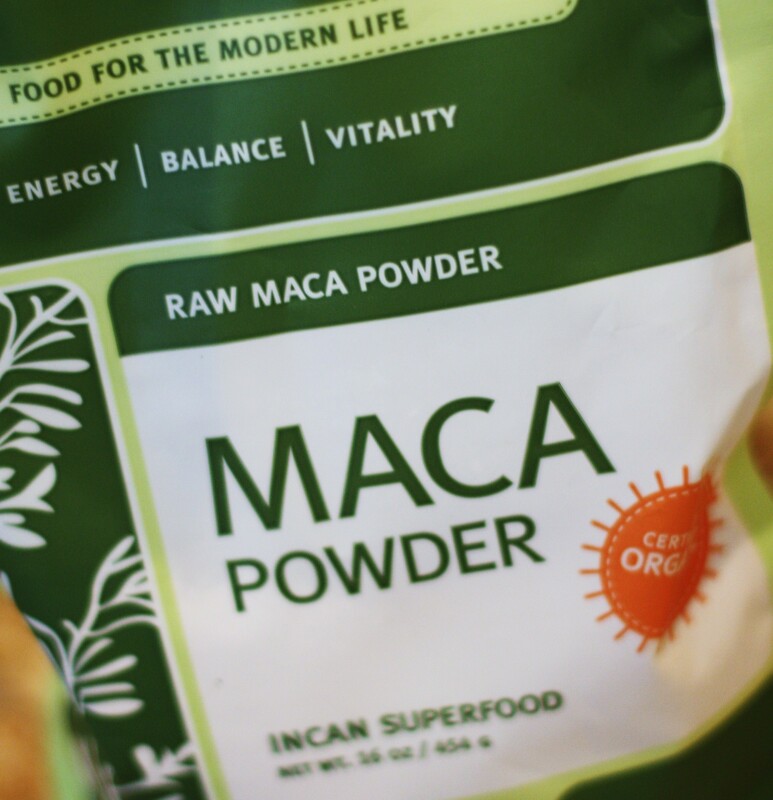 Taste-wise, it’s not very strong, I think it has a slight malty/sweet flavor, making a teaspoon of this stuff a great nutritional addition to smoothies, oatmeal, yogurt, etc. The other superfood would be cocoa powder. No, not hot cocoa, nor dutch-processed (which are both processed versions of the real stuff), but naturally unsweetened cocoa powder, which is rich in antioxidants (quite specifically, of the flavanol family), while also providing plenty of minerals such as copper and magnesium. But the best part about this stuff? It’s chocolate. The end. These two ingredients completely transform this smoothie; it becomes an indulgent, satisfying drink while also packing a nutritional punch. Usually I do use Hershey’s Cocoa Natural Unsweetened, but I only had the dutch-processed version at home (whoops). I also add a teaspoon of instant coffee granules, though this is completely option and NOT necessary at all because of the already stimulating and energizing effects of the bananas, maca powder and cocoa powder (but I’m just a coffee addict… sorry). Alright, enough of my blabber, let’s get started on the smoothie making, shall we?? You guys, TRY this and thank me later. I’m serious!